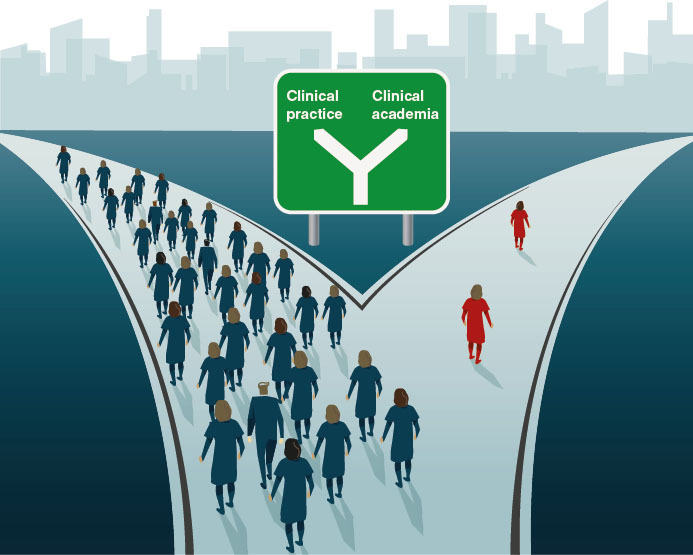 Too few nurses and midwives embark on careers as clinical academics, and there is a need to increase awareness of these roles, say leading nurse academics. Research has a powerful role to play in developing the nursing profession, but the number of nurses and midwives taking on dual clinical and academic roles is too low. Nurse clinical academics split their time between working clinically and conducting research – often holding a joint appointment between a university and a healthcare provider. Last year, the Council of Deans for Health said the relative number of clinical academics in nursing, midwifery and allied health professional roles was ‘tiny’ and called for more development of clinical and academic dual roles. Estimates in 2014 by the Association of UK University Hospitals showed there were fewer than 300 research professors in nursing and midwifery, which is less than 0.03% of the total nursing and midwifery workforce. It seems the barriers to nurses’ going into research are not financial, and more to do with awareness, confidence and ability to make a compelling case. Health Education England and the National Institute for Health Research (NIHR) offer an integrated clinical academic programme (ICAP) in England. This offers fully funded fellowships for doctorates, as well as a range of other academic awards, including a new master’s-to-doctorate bridging award. According to NIHR figures, allied health professionals are out-competing nurses and midwives in winning academic funding awards from the programme. Since 2010, 296 nurses have gained masters’ degrees through to postdoctoral funding awards, compared with 392 allied health professionals. Midwives fared even less well, with only 30 awards made across all academic levels. The same figures show almost one in five (18%) of the available funding opportunities were not even awarded at the academic levels intended. This suggests non-medical clinicians, including nurses, have not been making successful applications, or applying in the first place, for clinical academic awards, particularly at higher levels. In these cases, the funding was reallocated, says Florence Nightingale Foundation clinical professor of nursing and midwifery research Debbie Carrick-Sen. Professor Carrick-Sen, who is based at the University of Birmingham and Heart of England NHS Foundation Trust, co-chairs the Association of UK University Hospitals clinical academic development group and sits on the doctorate funding panel. South Warwickshire Foundation NHS Trust family nurse Alison Lewis had a clinical academic internship through Birmingham Health Partners. Aimed at non-medical clinicians, the internship is a 30-day programme to help develop research skills. It offers mentorship, a placement in a research setting and full sponsorship. ‘I always wanted to do research,’ says Ms Lewis. ‘The internship gave me thinking time, and it took me out of my busy, everyday schedule. Ms Lewis conducted researched looking at clinical supervision to improve nurses’ confidence in having difficult conversations. ‘It has confirmed I want a clinical academic career,’ she adds. Although her job was backfilled, colleagues’ long-term sickness meant Ms Lewis struggled with her workload. But she is undeterred. She has secured funding for further research and hopes to continue on a clinical academic pathway. She says poor-quality applications, a lack of local schemes and a need to embed academia in nursing roles are at the root of the problem. Until recently, not enough research exposure and awareness of research roles was evident in the pre-registration nursing curriculum, she adds. ‘I have about 200 students and only one or two had ever heard of what a clinical academic is – the awareness isn’t there,’ Professor Carrick-Sen says. She adds there is evidence that, within a year of starting work, new nurses become too embedded clinically to consider a career in research. However, she says while there has been a gap in nursing representation at the higher levels of the ICAP funding, this is starting to change. ‘For the first time this year, there were more doctorate applications that were fundable, than were available,’ says Professor Carrick-Sen.
A recent national curriculum review of nurse training is promoting research roles and changing the agenda, she says. There are ten universities in England where students can do master’s-level, fully supported programmes as part of ICAP. And each post comes with salary backfill funding. Similarly, at doctorate level, benefits include salaries paid with full research, training and development costs met. Professor Carrick-Sen believes allied health professionals do better in their applications than early-career nurses and midwives because they have more autonomy, and their own caseloads. This gives them the confidence to embark on research, she suggests. Nine years ago, Foundation of Nursing Studies chair Tony Butterworth wrote the first UK report on developing nurses’ clinical academic careers. He made a series of recommendations, which formalised a funding framework for clinical academic training. ‘Now there is an opportunity that absolutely wasn’t there before, which is fantastic,’ Professor Butterworth says. But he says universities do not take a consistent approach to steering nursing students to take a more academic route. Professor Butterworth says one issue is not just a lack of applications, but the quality of some of the submissions, although he says this is changing. RCN professional lead for education Anne Corrin says clinical academic careers are ‘extremely important’ in ensuring nursing continues to develop its evidence base. She points out that nurses need support to develop their research skills throughout their careers to feel confident about undertaking research. ‘Research needs to be embedded in all nursing roles, be it identifying and critiquing evidence to supporting practice, or undertaking large scale research projects,’ she adds.